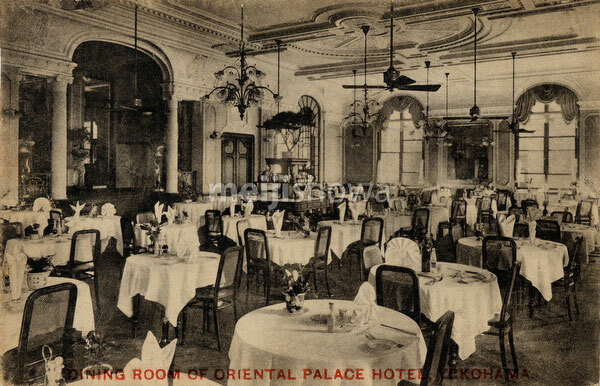 The dining room of the Oriental Palace Hotel on Kaigaindori in Yokohama, Kanagawa Prefecture. Located near the French Pier (フランス波止場, Furansu Hatoba), it was opened in 1903 (Meiji 36) and ran until it was destroyed by the Great Kanto Earthquake of September 1, 1923 (Taisho 12). Although sharing almost the same name, it was unrelated to the Oriental Hotel in Kobe. Interestingly, both were famous for their excellent cuisine.